← Merry Christmas! Priecīgus Ziemassvētkus! When it came time to discuss what we would be having for our Christmas dinner, my husband knew immediately that he wanted šķovēti kāposti, which is braised sauerkraut. I couldn’t remember if I had had it at any of the restaurants or at my mother-in-law’s house, so I was a little unsure of just what would happen to sauerkraut when cooked for a long time. As it turns out, it becomes really, really good. 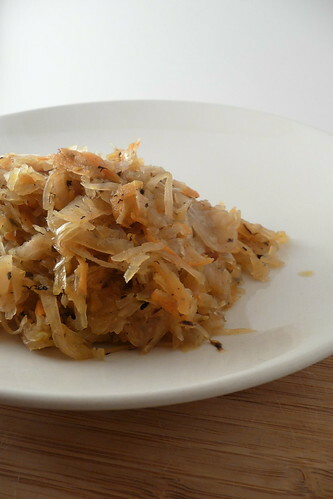 The cooking process eliminates all the things I don’t like about fresh sauerkraut – namely the sharp bite and crunchy texture. Now, don’t get me wrong, I like sauerkraut but I love braised sauerkraut. The thing about this dish is that while it’s good fresh off the stove, it’s one of those dishes that can really benefit from an overnight stay in the fridge. I really enjoyed it for dinner but it was even better at lunch the next day with some leftover potatoes. Šķovēti kāposti can easily be converted to vegan – just use your favorite oil and sweetener instead of bacon fat, butter or honey. Add enough water to cover the sauerkraut, scraping up any bits or layers at the bottom of the pan. Bring to a boil, cover and reduce to a simmer. Check periodically and add more water as it is absorbed, much like a risotto. Cook for 2 to 3 hours. The sauerkraut should be uniformly brown and tender. Stir in the grated carrot. Add honey a tablespoon at a time, tasting after stirring. It shouldn’t be strongly sour, but with light overtones of sweet. The honey is intended to remove some of the “bite”. Season with salt and pepper to taste. Cook, uncovered, adding water as necessary, until carrot is tender and blends nicely into the sauerkraut mixture, about 20 – 40 minutes more. Recommended to serve with boiled potatoes and savory meat dishes. This entry was posted in dairy-free, gluten-free, latvian, recipes, side, untranslated, vegan, vegetable, vegetarian. Bookmark the permalink. ..I ADORE skoveti kaposti ..you will find it in every Latvian house in big celebrations ..
We love šķovēti kāposti! In fact, we just bought two more huge jars of sauerkraut to use later this year on a new šķovēti kāposti experiment — the slow cooker. It’s a wonderful dish but sometimes the adding of water gets tiring so it seems like it should be perfectly suited.